The Collected Interior: Frugalicious Friday & a Giveaway...Fantsy Facade! Frugalicious Friday & a Giveaway...Fantsy Facade! Welcome to the 32nd edition of Frugalicious Friday! You know the deal...This day's all about sharing your fabulous, thriftiest, most frugalicious home decor finds! And if you revamped your find in a fab Craft or Diy project, well tell us about that too...we can always use a little extra Diy inspiration! Are you new to Finding Fabulous? Then click here for the guidelines on this fun day that's all about $aving! I'm super excited to introduce you to our newest sponsor here at Finding Fabulous...Fantsy Facade! 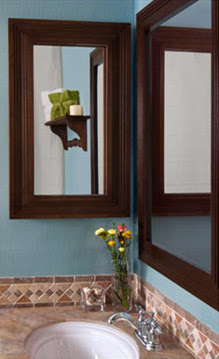 Fantsy Facade can rejuvenate your bathroom space for a custom high-end look at a value price...love that! 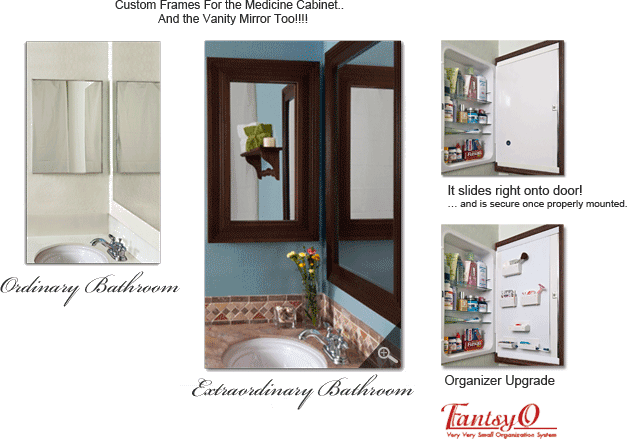 Fantsy Façade is an innovative framing system designed for the recessed medicine cabinet. It just SLIDES onto the door. Finally...take your ordinary medicine cabinet from bland and dated to fabulous and updated! Color choices include Legacy in white. And they offer a total of 10 color choices to choose from...click here to view! Fantsy Facade also offers Vanity Mirror Mouldings for those unsightly builder grade mirrors, as well as Trim Mouldings sold in 8 foot lengths...so that all the new Fantsy Facade mouldings in your new updated bathroom will match. they make it so easy! For our giveaway today...Susan from Fantsy Facade is generously offering two $100 gift certificates towards any Fantsy Facade product to two lucky winners! 2. Follow Finding Fabulous. And leave a comment. 3. Tell me which Fantsy Facade product you'd like to win! And leave a comment. Okay, three comments, three separate entries...giving you three chances to win! Link up and give us the scoop on how you find fabulous! I'll announce the winner next week in my Frugalicious Friday Favorites post either Tuesday or Wednesday...Good luck! I would love to get a medicine cabinet. I don't have any! I would love 1 sedona & 1 white cabinet cover. Ours are unsightly...what an awesome idea! I'm a follower already....duh, who wouldn't want to be?! Lastly, I've linked up and am so excited because we are hosting our first link up party. We'd be honored if you would come link up Jane! You're awesome. I am already a follower of your wonderful site. If I were to win I would love to have the vanity trim Vintage in Dover White. This is a great new sponsor with a very innovative product. Hi! Thanks for hosting! and btw...what a great giveaway! can you delete my first topiary link?! i chose the wrong image and i can't delete it. thanks! ps-are my other projects ok to link up? for the most part they are all very affordable projects and a lot use things i bought at the dollar store or things i already had. I follow finding fabulous and would love to win! When we moved into our house five years ago I had mentioned to my dad what I wanted a new medicine cabinet because ours was rusty and looked exactly like the one in the before picture. I had to work that day and when I came home, I saw that he had replaced the medicine cabinet with a brand spanking new one that looked exactly like the old one! :) I was so appreciative of his generosity that I haven't been able to change it. I hope that is about to change! All of the woodwork in our home is white, so I'd love the Dover White Stained model. Thanks so much for hosting Jane! Pick me pick me!! I would love the painted white one its to die!! I think I would love the white or the black? Probably black! Please forgive me for only officially following your blog starting today. I've been here many times before!!!! Thanks for hosting, Jane! 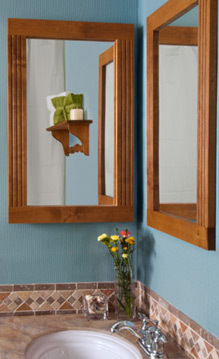 My Mom could use these in her bathrooms; she has this type of set-up in both of hers. I am totally a follower Jane!!! And this new sponsor is amazing! What great products! I just realized I only looked for something for my upstairs bathroom!! LOL For that I would love the light blue frame as my bathroom is blue. Or the one of the ones with the sugar maple finish. For downstairs the Rosette would look pretty. I would also like the organizer thing for the door. first, thanks so much for hosting. love looking at all these great ideas. 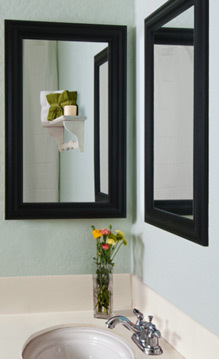 but i really love this giveaway for the simplicity that it just slides over the medicine cabinet door. genius! i love the black sleek one, which would be perfect for our new half bath we are putting in the basement! I linked up!! Such a great party, thank you!! I'm a follower of course!! Love your blog, your so cute! I think I need the contemporary black for my master bath. I linked up my basil planter. 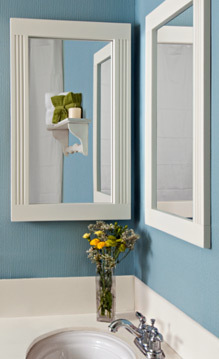 I love the Sedona White frame for the medicine cabinet. I'd love to do this for my kids bathroom. Love the Sedona in Walnut! Linked up 2 goodies this week! Hey, Jane! Thank you so much for hosting! I just linked up! I heart the burnished walnut! I follow your blog!! I love all the cool stuff you have for us each week!!! Thanks!